Some days ago, looking at how popular the potato salad recipe had become, I realized that one of the most popular recipes in traditional contemporary Dominican cuisine had not been published yet: “Russian salad”! Years ago, when I worked as exchange visitor for the YMCA of Greater New York, I made many friends, most of which I still stay in touch with (Thank God for Facebook!) Once, while chatting with a great Russian friend, the conversation ended in food (as almost all my conversations!) When I shared that there was a salad in my country called “Russian”, she quickly asked me to explain the ingredients and how it was made. I didn’t really expect what came after: The “Russian” salad is genuinely Russian. It is a common recipe in Russia. Go figure! The Russian salad is very similar to a common potato salad. But some ingredients can make a great difference! The ratio depends on your taste. Most people use a four to one potato to other ingredients ratio, but you don’t have to go that way! Some people use a one to one potato to boiled eggs ratio and end up with a delicious egg salad that needs almost no mayonnaise as the yolk creams and largely compensates. Other people (Me included) increase the beet ratio, which gives a sweet flavor to the salad, while adding color. Adjust to your taste! Sour orange or lemon juice. In lack of those you may use white vinegar. Boil the potatoes, carrots and beets and mix them with the other chopped ingredients and those canned and we add mayonnaise. Remember to boil the beets separated and whole to avoid them losing color. Add a bit of sour orange or lemon juice and rectify the salt. 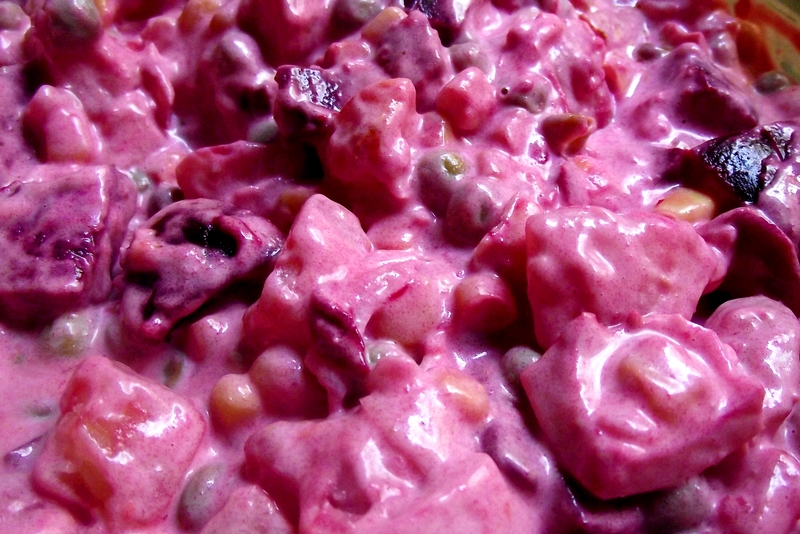 This entry was posted in International food and Inventions, Traditional Dominican Food, Vegetarian, Vegetarian - Lactoovovegetarian and tagged beet and potato salad, beet salad, boricua, cocina, cocina dominicana, comida criolla, comida dominicana, comida tipica, comida tipica dominicana, comida tradicional Dominicana, criolla, criollo, cuba, cubana, cubano, dominican, el fogoncito, ensalada de papa, ensalada de papa boricua, ensalada de papas, Ensalada rusa, navidad, puerto rico, puertoriqueño, recetas dominicanas, recetas navideñas, recetas rusas, recetas y comidas, recipe, remolacha, reseta, russian récipes, russian salad, Tipica, tipico. Bookmark the permalink. 4 Responses to “Russian” salad! I know! The beets give that beautiful creamy pinkish color! Hi Arturo – Even though I’ve only been following your blog for a short while now, I think it’s awesome – I have just received the Versatile Blogger Award and I am nominating you as a recipient. Congratulations! Wow! I’m humbled Bill, not by the nomination but your kind words. It makes me so happy that others find my recipe interesting, likeable and prepare them. I’m not sure how the process works but do let me know if there’s anything required of me.